The Soap Dispensary & Kitchen Staples is Vancouver's first zero-waste grocery store and one of only a handful in Canada. Vancouver's first zero-waste food grocery store officially opens Saturday. 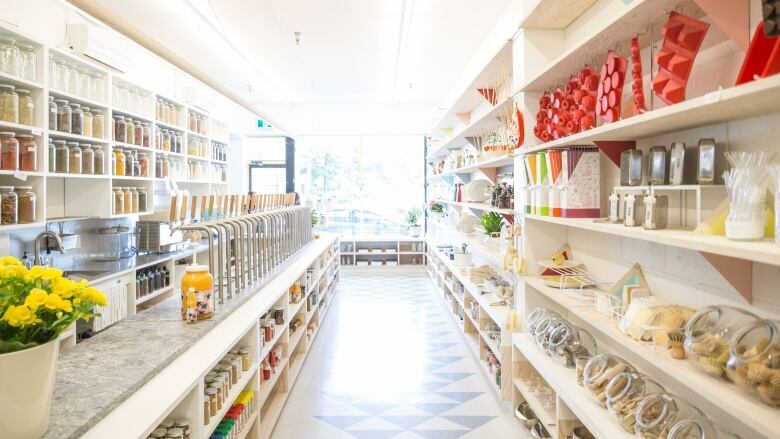 The Soap Dispensary & Kitchen Staples at 3718 Main Street joins other zero-waste grocery stores such as Salt Spring Island's Green Zero Waste Grocery, Ottawa's Nu Grocery and Montreal's Épicerie Loco. The Soap Dispensary first opened in 2011 as an environmentally-friendly refill shop offering cleaning products in bulk, reusable containers and kitchen wares. But now, the husband and wife co-owners have expanded their shop to include groceries such as berries, herbs, cheese and dips. "You won't find a shred of plastic in there," said On the Coast food columnist Gail Johnson who took a tour of the store. Johnson said owner Linh Truong realized customers wanted more than cleaning supplies and personal cosmetics. Truong wanted a place where food could be purchased without plastic packaging, which led owners to offer kitchen staples. Cooking oils, honey, vinegar, soy sauce and tamari are all on tap. Close to 50 herbs and spices, chips, seeds, yogurt and catnip have also been added. Lower Mainland food suppliers have begun delivering their products to the store. Perogies, dumplings, vegan cookie dough, wheat and oats fill the shelves next to plastic-free cooking and cleaning utensils. Truong said the goal is to reduce and reuse materials — and only use recycling as a last resort. "Critics will say recycling does have its own problems. It takes energy, it takes transport, there's pollution involved," said Johnson. "While bulk food stores are great about reducing food packaging to a certain extent, you still have to use a plastic bag or plastic container for your peanut butter or dried lentils." Ideally, customers will use their own glass containers, though they are available to buy at the store. "Kind of old timey, kind of quaint, but it works," said Johnson. Also on the horizon is a second zero-waste market called Nada. That organization has operated pop-up shops in Kitsilano and at other venues such as farmers markets around Vancouver since 2015. They are now working on opening a brick-and-mortar location at 675 East Broadway.